There are many circumstances where you may find yourself needing to guess the age of a young wild rabbit. Rabbits can nest in very difficult places, such as in grass and on roadsides, which mean the nest can be easily disturbed. The mother rabbit will then leave the nest, and the babies can scatter. There are a few markers to help you predict how old the baby you have found is. Check if the rabbit is still 'naked', or if it has started to develop fur. 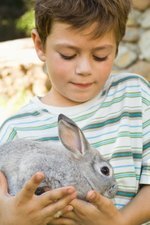 Rabbit's coats begin to develop between days 1 - 7, so a mainly naked rabbit would be hours or days old, whereas a rabbit with thin fluff would be around a week old. If the rabbit has a full coat of hair, it will be around a fortnight old. Watch the rabbit to see if its eyes are open. This should be fairly obvious - if the rabbits eyes have opened, they will usually be open. Most rabbits do not keep their eyes closed for long period of times. Baby rabbits open their eyes between day 5 and day 7. Look if the baby rabbit's ears move. Baby rabbits' ears open between day 2 and day 7, but it is usually very difficult for anyone without veterinary experience to check if this has happened. The babies ears will become erect between days 9 and 12. Offer the baby rabbit some rabbit food or Timothy hay. Wild rabbits begin to wean around day 12 and 15, so if the rabbit is displaying an interest in eating the food you offer, it is likely to be just over a fortnight old. Check if the baby rabbit is alert. 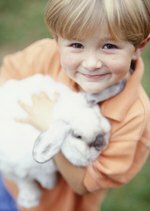 If it appears nervous and jumpy, and responds to sudden noises, the rabbit will be around 21 days old. It will be almost completely independent now, and it's scared reaction to humans is completely normal. This fear of humans will protect the rabbit. Gently measure the rabbit. Try not to disturb it, as it may run away. Wild rabbits grow at varying speeds, but when they reach 17 days, they usually measure 5 - 6 inches long. Watch the rabbit. 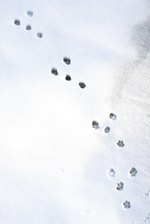 If you are concerned about it, take a few photographs and bring them to a vet. The vet will be able to tell you the approximate age, and if you need to do anything to help the kit, such as leaving food out.